Editorial Calendar FAQs :: "Will 2018 Work For 2019?" and "Do you post PDFs?" An Editorial Calendar is a pre-plan that a magazine puts out to let people know where they are going with each issue. Because it's a projection a year in advance, things do change, especially with a weekly magazine. But for the most part, the magazines stick to their grand plan. It's what is between the lines that you are trying to get into and featured in! Magazines also post sponsorship opportunities that can be very good placements for your business. Tin Shingle recommends both advertising and organic editorial. After all, without advertising, there would be no magazine. More importantly, however, the advertising has gotten very good over the years with branded content and niche opportunities. Can I use last year's 2018 Editorial Calendar? Heck no! This has been the most surprising question of all. In fact, some media agencies have re-posted 2018 Editorial Calendars to their websites as PDFs, and slapped a 2019 over top. We discovered this during our own online research. Right away, the very unique themes looked familiar. How did we know so quickly? Because every month at Tin Shingle during our "What To Pitch This Month" TuneUp webinar, we go over the best themes with you, encouraging you to pitch an idea to get featured in a print magazine. Where does Tin Shingle get their Editorial Calendars? Straight from the magazines themselves. If it doesn't come from the magazine, we don't use it. If the Editorial Calendar is not posted on the magazine's website, we email into someone at the magazine. We want to know about the best editorial and sponsored opportunities, and we only trust the most reliable source: someone on staff. Does Tin Shingle post Editorial Calendars as PDFs? No. We transpose the information into our searchable database. You get to look through an easy list of themes, organized by title of magazine, and area of interest. 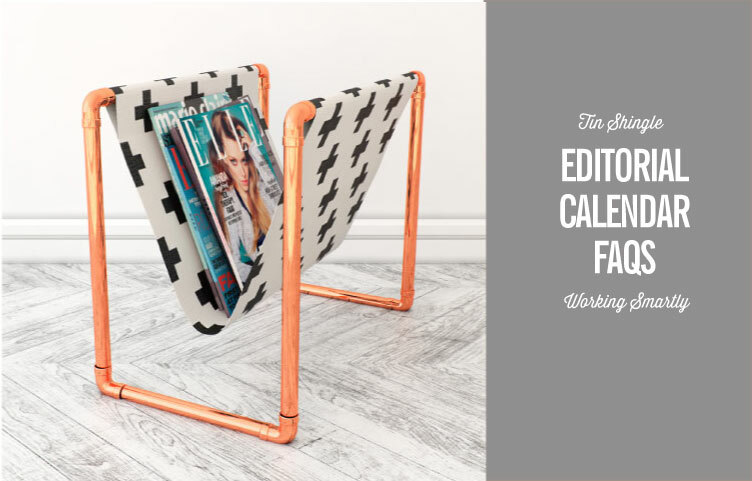 Do you need an Editorial Calendar to pitch a magazine with an idea? Not at all! Especially if you've been reading the magazine to be up on what they are covering, you can email them an idea at any time. Having an Editorial Calendar gives you top-line guidance of what direction the magazine is headed in each month or week. My business is too small to be written about in a magazine, right? Not at all! Magazines of all kinds would want to write about your or your business. They just need to be led to the water, and you're going to lead them. Start listening to Tin Shingle's TuneUps to tune your mind into this way of thinking so that you can start generating buzz in the media. If you work for a larger company, or if you run that larger company, then you already know this, and your wheels are turning for how to get media coverage.